The fast and easy way to start fundraising online. 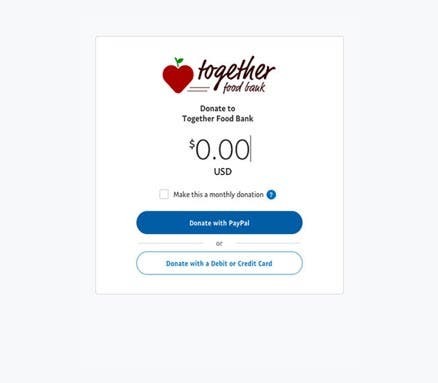 Accept donations online and in-person today with PayPal. Keep your fundraising costs down. PayPal offers discounted transaction rates for 501(c)(3) charities for most products, and consistently low rates for all other nonprofits. No extra fees for setup, statements, withdrawals or cancellation. 2.2% + $0.30 per transaction and no monthly fee for charities. An easy way to accept payments online. One simple button lets you accept credit cards, debit cards, and PayPal - in a few minutes. The button can be used on your website or in emails. Plus, donors can easily select to give automatically on a monthly basis. Get a PayPal Donate Button. If you already accept donations online by credit card, add Express Checkout for those who prefer to donate with PayPal. Customers who activate One Touch can stay logged in to complete their purchase on your website or app without entering password or credit card details for each purchase. PayPal Here is an easy way to accept credit cards, debit cards and PayPal right on your smartphone or tablet. It's perfect for selling tickets, taking auction payments and collecting donations in person. U.S. swipe transactions are at a low fee of 2.7%. Send your donors your nonprofit’s personalized PayPal.Me link to allow your donors to contribute to your cause. Other industry solutions that accept PayPal. 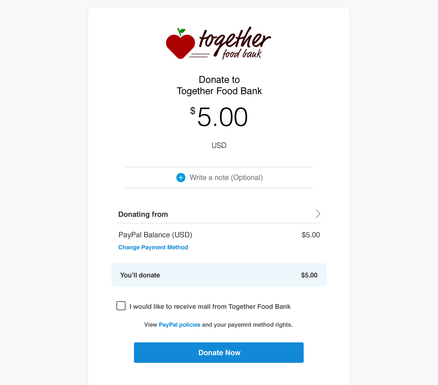 We’ve teamed up with leading online fundraising sites to include PayPal in their CRM systems, crowdfunding and other offerings for nonprofits. If you already have a provider, ask them how to activate PayPal on your site. If you’re looking for more options, check out some of our great fundraising partners. The PayPal Giving Fund offers charities of all sizes access to customer giving programs across PayPal, eBay, and more. It's a network of good that can put your organization in front of millions of potential donors. Learn more about PayPal Giving Fund. When your donor gives money through PayPal, the money usually shows up in your PayPal account within minutes. From there, transfer it to your organization’s bank account at no charge. Over 500,000 nonprofits received billions through PayPal last year. Donors love the convenience and security of PayPal, while nonprofits can boost donations and lower costs. Track every dollar and donor. Monthly statements, downloadable logs, and instant transaction searches are all part of your PayPal account. You can also offer controlled access to your employees or volunteers for tasks like mailing donors. Donations made through PayPal are secure. Automatic fraud screening helps protect you and your donors. Plus, PayPal is PCI compliant, so it’s one less thing you have to worry about. Boost your fundraising and lower your costs by raising more money online. It costs much less than traditional fundraising methods and can yield better results, too. 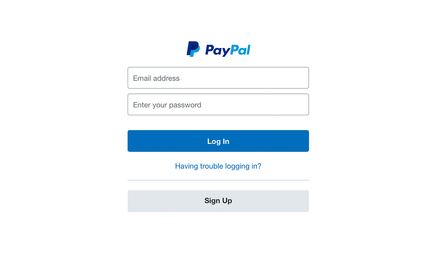 Find answers to specific questions you may have about using PayPal to assist with your nonprofit or other online fundraising. Learn how successful nonprofits use PayPal to accept donations online and in-person. You will also find our Getting Started Guide to help you get set up and accepting donations quickly. View the nonprofit case studies. 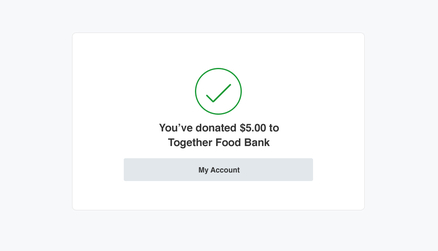 You don’t have to be a nonprofit to fundraise with PayPal. We've teamed up with the leading online fundraising partners that include PayPal in their offerings. See what they can do for your nonprofit. Blackbaud is the leading provider of on-demand constituent engagement solutions for nonprofits. Get a great giving experience combined with an easy donor database. Classy is a leading provider of fundraising management software for nonprofit organizations. Reach more people--raise more money. Raise funds for your nonprofit using social media. Harness the power of the world’s largest marketplace. Tap into new donors and raise unrestricted funds. Paperless Transactions: all-in-one software & mobile app for targeted donor campaigns & event registration! What do my donors see? 1. Donors click on your website donation button. 2. Donor enters amount and selects payment type. 3. Donor logs into PayPal or enters credit card information. 4. Donor reviews and agrees to payment. 5. Donor get confirmation of payment.